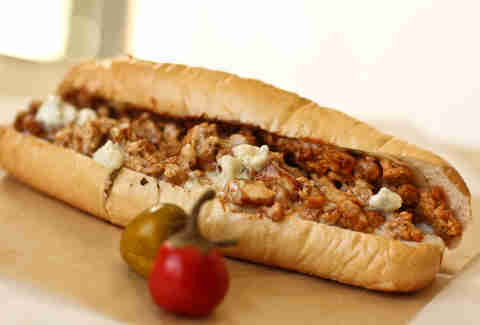 From the Philly-born guy behind Beer Belly (legit alert! ), Whiz is a standstaurant right in the middle of town that's literally dripping with homemade cheese whiz, and by literally, we mean... figuratively. 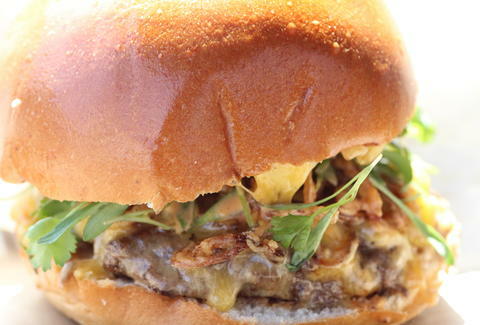 Wanna see all the loaded burgers, cheesesteaks, Sriracha fries, and bacon-wrapped meatballs? Yeah you do. 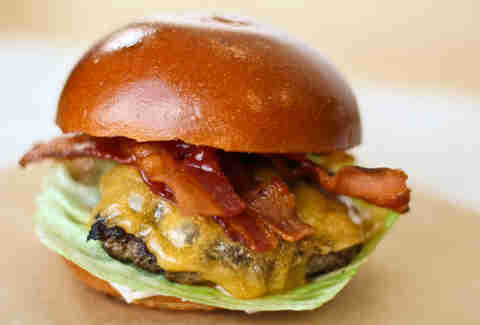 Breezy Bacon Burger: This meat-monster's got sliced sharp cheddar, applewood-smoked bacon, lettuce, and house Italian mayo. 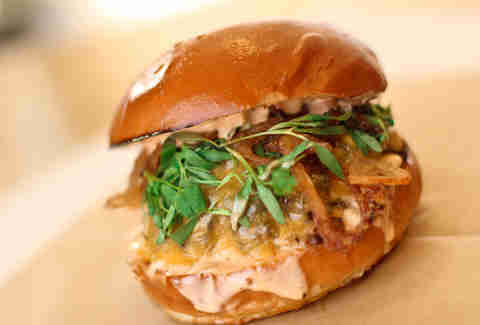 The P-Dub Burger: This guy's slathered in both American and Tillamook cheese, fried shallots, and micro-cilantro, plus "Sriracha Island", which is a dressing/sounds like pretty much the best place to be stranded ever. 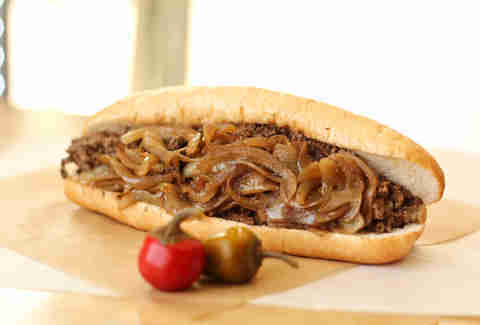 Whiz Wit: This guy's sloppy, with grilled onions and their gooey, homemade cheese whiz. 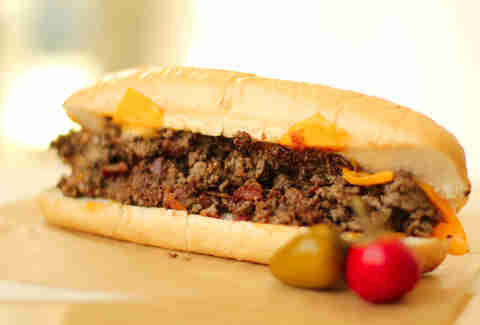 Hahahaha... homemade whiz. Buffalo Bleu Chicken: Super Bowl-winning-inept chopped chicken breast slathered in sauce and grilled up with chunky bleu cheese dressing and Provolone. 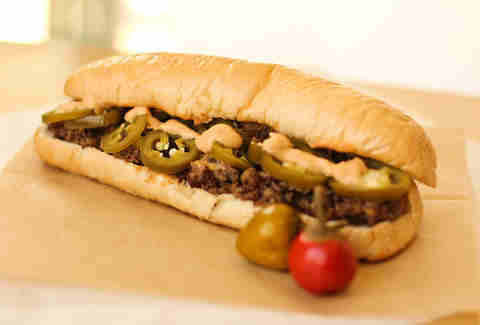 Jalapeno Jack: Exactly like the name, with house-pickled peppers added for an extra kick/cooler-looking photo. 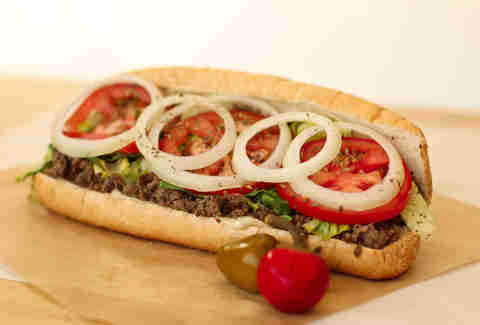 Cheesesteak Hoagie: Essentially a sub-sandwich PLUS a classic cheesesteak, topped with onions, lettuce, tomatoes, and dressing... because salads don't belong on the side. Bacon American: Get uber patriotic with this Philly that's got somehow-melted-on-the-top-side-of-the-bun cheddar and applewood-smoked bacon. 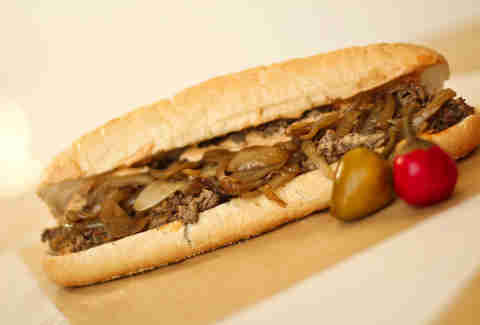 Philly Steak: This variation's got no cheese -- just onions and steak on a Brotherly-Love-imported Amarosa roll. 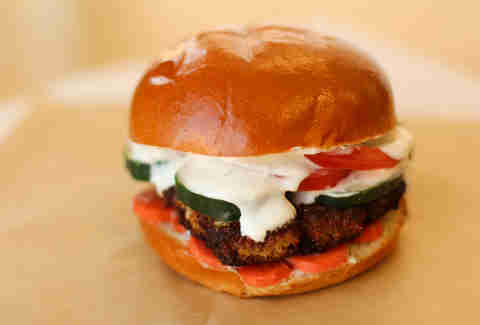 Falafel Burger: A veggie guy you'll actually want to eat -- assuming you haven't looked at any of the previous pictures -- thanks to falafel, tzatziki, and spicy pickled carrots. 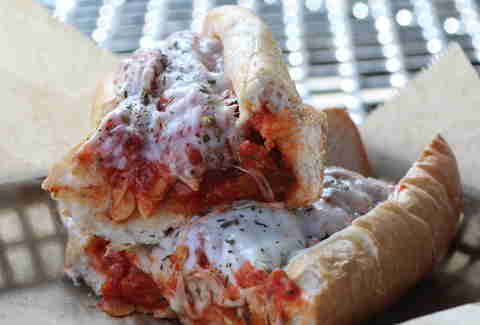 Balls O Bacon: Pork shoulder meatballs wrapped in bacon, and topped with chunky marinara and Provolone. Read that again. 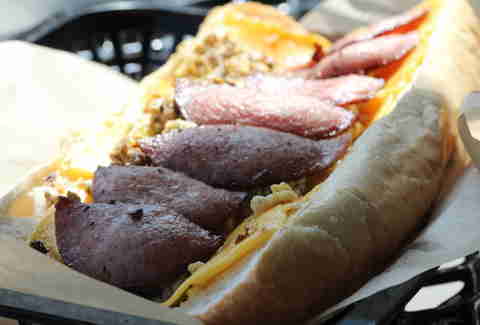 Pork Roll: "Breakfast" topped w/ pork sausage, griddled-up eggs, and cheese (enjoy anytime). Fried Chicken Sammy: Extra-crispy in a tarragon batter with Italian mayo, applewood-smoked bacon, and pickled jalapenos on a brioche bun. 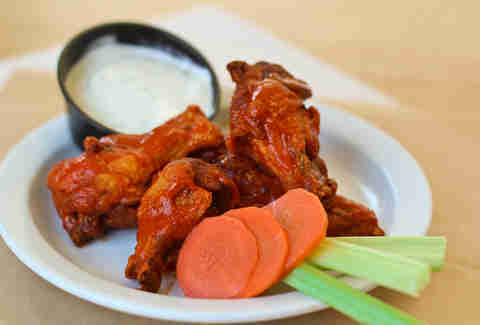 Wings: You've got three options: Buffalo, sweet & spicy basil, and what Steph Curry's teammates said that time he asked them what kind of Bull energy drink they wanted (Red Curry). 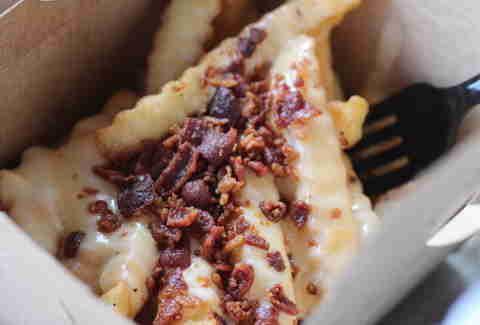 Philly Mega Fries: Three cheeses (Provolone, mozzarella, whiz) and bacon. 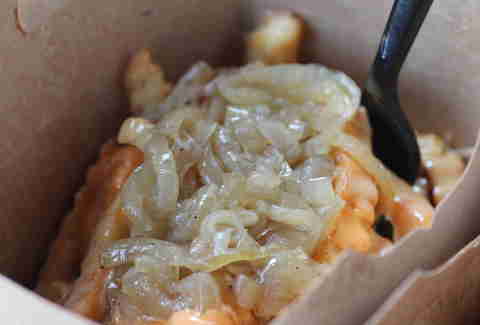 Sriracha Beast Fries: Loaded with that Sriracha Island dressing, plus cheese, plus onions, plus so much yes.